Do you know what causes hearing loss? Did you know that 11 million people in the UK are living with hearing loss? Action on Hearing Loss predicts that this number is likely to rise to 15.6 million by 2035. Hearing loss is a growing public health concern, yet many people remain unaware that their hearing is impaired. Our ears contain several thousands of tiny hair cells in the inner ear that convert sound waves to electrical signals to the brain, giving us our sense of hearing. These cells are delicate, and long-term exposure to high decibel noises can damage them. The damage is irreversible, leading to gradual but permanent hearing impairment. Since the process is so slow, many people do not even realise that they have a hearing problem. Furthermore, even after acknowledging hearing loss, for a variety of reasons many people still do not seek help, which leaves their hearing to deteriorate further. Studies have shown that people wait for an average of seven years before acting on their hearing loss, despite the fact that the sooner it is addressed, the more your hearing can be preserved. Exposure to loud noises is a common cause of hearing loss. This is usually a gradual process where continuous exposure to high decibel noises leads to deterioration of hearing. However, a single, extremely loud burst of sound can also trigger hearing loss (although this is less common). Presbycusis, or age-related hearing loss, is another cause, where the hair cells naturally deteriorate as a person ages. From the age of 40 years many people start losing a small amount of their hearing, and by age 80 many people face significant hearing loss. Head trauma or viral infections (such as mumps, measles or rubella) can lead to hearing loss. Certain diseases such as meningitis and encephalitis can affect a person’s hearing. Hearing loss does not necessarily just make the world ‘quieter’. Even mild hearing loss can make it difficult for an individual to pick out important cues in speech, especially in a noisy environment. Because of the significant impact that hearing loss can have on a person’s quality of life, Leightons want to help everyone better understand the issue, so we decided to let people experience hearing loss for themselves. Watch the video here. As hearing loss is usually a gradual process, it’s something that may not be detected until it’s too late. However, it can progressively impact your quality of life in various ways. The good news is that you don’t have to live with hearing loss. 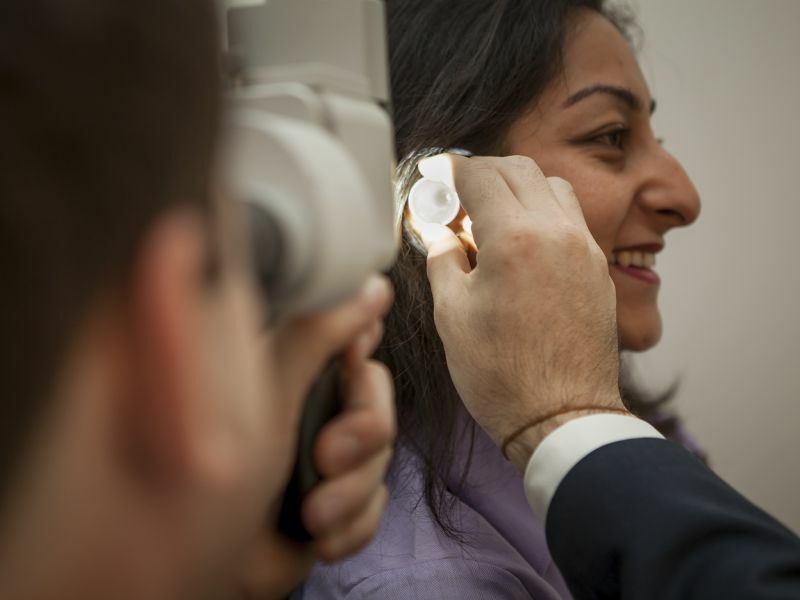 At Leightons Opticians & Hearing Care we offer a free hearing assessment, which will help us understand the extent of your hearing loss. Should hearing aids be required, we can recommend the aids that best suit the level of your hearing loss as well as your lifestyle. We have a wide range of digital hearing aids from some of the best manufacturers in the world, such as Oticon, Phonak, Widex and ReSound. To book your free hearing assessment, call us on 0800 40 20 20, book an appointment online or visit your local branch.